In sheer numbers the Unisaw is one of the most widely distributed woodworking machines ever produced. Its production run spans over a half-century making it the longest running production of any table saw in history. Over the years many changes have been made to the saw. The purpose of this article is to document all the significant changes made to the saw since its introduction in 1939. The base line for this study is the 1939 No. 1450 model. The order taken in this type study is roughly from top down (table to floor) and outside in. As parts were changed the intent is that the particular part will be noted with the year of change. 1939: Unisaws were made in Milwaukee, WI. 1952: Manufacturing was moved to Tupelo, MS following the closing of the Delta plant in Milwaukee. Serial number tags found on saws after 1952 will indicate a Pittsburgh address though during a short period right after the move it appears that left over tags marked Milwaukee made it onto a number of machines. 1939: The user’s manual was simply titled, “Instructions for Adjusting and Operating No. 1450 Tilting Arbor Saw”. No other designations (PM number) is given on the manual. This eight page manual is marked on the last page as “Form LTA-10-39”. An additional manual titled “Instructions for Operating Circular Saw Guards” may have also come with the saw. 1939: The LTA parts prefix was designated for all parts having to do with the Unisaw. Parts for the Unisaw began with LTA-401 (Table) and ended with LTA-552 (Coil Spring For No. 1471 Guard) Additional casting prefixes will be found on saw parts that were borrowed from other machines like the die cast dome knobs (NCS-prefix). This practice was common with all Delta machines. Please note that later in time Delta briefly used the LTA parts prefix for their 10” Tilting Arbor Bench Saw (contractor’s saw). Those parts started with LTA-800 and are not to be confused with Unisaw parts. Delta farmed out their casting work and some shops added additional identifying marks to the part number. What these marks mean, where the parts were cast, is not known. 1942: Part No. LTA-554 (Bearing Closure Nut) added to parts list. 1939: Table extension (LTA-402) were X-braced. Tables (LTA-401) had plain U-shaped 3/8” X ¾” milled miter slots (without T-slots). 1961: T-slots were added to the table. A washer was added to the end of the miter gage to allow it hang off the front of the table while engaging the T-slot. This allowed for using the gage to cut wider pieces when cross cutting. Early (year range)saws had a counterbore seat on the face of the table edge where the fence square-to-round washers/spacers (TCS-281) mount, with the round part in the counterbore and the square part having the saddle cut that holds the fence rail (LTA-439). Later saws (year range/after Serial No. DC-8366?) had the edge milled square and the washers just mounted flat on the edge. At some point (year)the washers/spacers went from a potmetal casting (easily broken) to a machined piece of steel. 1939: This saw came with the Micro-Set fence. At the same time as the release of the Unisaw this fence was also made the standard for the No. 1160 10-Inch Tilting Table Saw. 1960: The Jet Lock fence was introduced. The change with this fence was in the deletion of the thumb screw that tightened the fence against the rear rail. In its place was a large screw that was adjusted once or as required (did not need to be activated on every fence setting). 1939: The original Bakelite locking knob (NJ-247) had a Saturn shape (raised center rim). At about the same time in history this same knob was being manufactured by Davis Molding (Chicago, IL) under their Daka-Ware label and is presently still manufactured and available from Davis. It is not known if they manufactured the original knobs for Delta. 1939: The Fence Adjusting Knob (TCS-273) was borrowed from the older style saddle type fence head used on the No. 1160 10-Inch Tilting Arbor Saw. Actually the knob was redesigned at about the time of the Unisaw debut. This new knob design was domed on the face and had raised ribs perpendicular to the face (dome) on the outer rim. These knobs were painted black. 1960: The TCS-273 Fence Adjusting Knob was eliminated with the introduction of the Jet Lock fence. In its place part No. 422-04-105-5001 (Sleeve) was substituted. It required a one time setting (or as required depending on use) and did not need to be used every time the fence was set. 1939: The fence was locked against the rear fence rail via the No. NCS-272 (Knurled Nut). This nut, when tightened, drew a clamping arm (TCS-263 Rear Clamp Hook) up and against the rear fence rail. 1939: The front fence rail (LTA-439) was not drilled through for the mounting screws. Instead it borrowed the TCS-282 (Special Tube Bolt) from the No. 1180 10-Inch Tilting Arbor Saw which was clinched into place from the inside of the fence rail. The rear fence rail (LTA-440) was through drilled and held in place with the conventional LTA-455 (Shouldered Screw). 1942: The front fence rail (LTA-439) was through drilled and held in place with the conventional LTA-455 (Shouldered Screw). 1939: Catalog artwork shows the No. 864 Auto-Set Miter Gauge with two squared shoulders. This was the standard miter gauge at the time. Early miter gauges had decals and patent numbers cast into the head. 1940: An illustration in “Instructions for Operating Circular Saw Guards” dated 3/40 shows the No. 864 miter gauge with the left hand shoulder slightly clipped. It was noted that this was done to clear the blade guard. 1942: Catalog artwork for the No. 20-200 8-Inch Tilting Table Saw shows the No. 864 miter gauge with the two shoulders clipped at 45 degrees. It is assumed that this same gauge would have been sold with the Unisaw. Also by this time Delta was using the Delta/Milwaukee brand name and it is assumed that this would also have been cast into the head of the miter gauges of that vintage. 1939: One splitter and four blade guards were originally made available on the saw. No. 1473 Splitter and Anti-Kick Back Device consisted of the splitter and anti-kick back pawls and no blade cover. This set up tilted with the arbor. The No. 1457 Splitter Guard consisted of an enclosed aluminum blade cover, splitter and kick back pawls. The splitter mounted down through the table insert and into the interior of the saw cabinet below. This guard tilted with the arbor. The No. 1472 Swing-Back Guard consisted of a vented aluminum basket style blade cover attached to an aluminum casting that was in turn attached to a bent steel tube that attached to the upper left hand underside of the table. This guard was similar in design to the guards used on Delta’s tilting table saws and did not tilt with the arbor. The No. 1471 Super Safe Guard consisted of the vented aluminum basket style blade cover attached to a splitter that both attached down through the table insert into the cabinet and also at the read of the cabinet by way of a special rod. It also included the kick back pawls and tilted with the arbor. The No. 1155 Abrasive Wheel Guard, as the name implies, was for use with an abrasive wheel. It consisted of an un-vented basket style cover attached to a casting which was attached to a bent steel arm like the No. 1472. 1939: The cabinet (LTA-470) consists of four bent steel corner quadrants welded together with seams running vertically along each middle face. The over all size of the steel cabinet is 19 7/16” X 19 7/16” X 34”. On the front there is a 9” X 12” dust clean out opening, the opening has four tabs that the dust door rests against (two on each side about 1" long). Above that there is an offset smile shape opening where the blade raising shaft exits the cabinet. On the upper right of the cabinet front was an opening for the switch box. On the right side an oval cut-out is provided for the motor when it is at rest and the blade at 90 degrees. This opening would not have been factory drilled for the goose egg motor cover. On the back a smaller symmetrical smile shaped opening is provided for the rod holding the Super Safe Guard. The left hand side has a single hole covered by an escutcheon plate where the blade tilting shaft exits the cabinet. 19XX the dust door opening changed to have two 6" long tabs on the sides (one each side) and two tabs on the top 2" long. These tabs are for the dust door to rest against. A late 1947 saw exhibits these tabs, so this change must have been made sometime prior to that date. 1939: LTA-478 (Bottom Pan) was provided between the saw cabinet and cast iron feet. It was held in place with the same 16 (yes 16) 5/16” X 1” carriage bolts holding on the feet. 1950: This was the last year of production in which the the bottom pan (LTA-478) was used. 1939: The dust door (LTA-480) fits within the 9” X 12” opening on the cabinet and had rounded corners. These doors were two-piece with bent edges that fit within each other and were welded. These doors did not have louvers. Doors were held in place with a shaft (LTA-483) and cam (LTA-484) and operated by turning a knob (TCS-273) on the front. These knobs were painted black. Finishing off the front was a decorative aluminum tag (LTA-448) with the name DELTA screen printed onto it. Saws for export would have this plate with the name TAUCO (LTA-454) imprinted on it. Tauco (TAUtz COmpany) was the company owned by Herbert Tautz for export of Delta machines. He continued to own the company after he sold Delta in 1939. 1944: "DELTA" nameplate (LTA-448) was temporarily made from sheet steel, probably due to wartime shortages of aluminum. 194X: The door became louvered and had two 3.325" circular holes on the back of the two peice door toward the top. 1950: This was the last year of production in which the two-piece door was used. 1939: The tilt scale is graduated from 0 to 45 degrees. Imprinted on it are the words, Delta Mfg. Co. Milwaukee, Wis. Made In The United States of America. This is followed by Serial No. and then the serial number is stamped after that. Serial numbers began with a single letter, a hyphen and finished with a three-digit number (exp. A-123). 1944: Tilt scale (LTA-427) was temporarily made from sheet steel, probably due to wartime shortages of aluminum. 1939: Switches were technically optional and varied by what motor was purchased. All saws shipped with a rectangular hole cut out on the front upper right of the saw cabinet. This hole was covered at the factory by an LTA-445 (Delta) or LTA-501 (TAUCO) aluminum screen printed switch plate. Imprinted on the switch plate were ten US patent numbers, two design patent numbers and three Canadian patent numbers. The single phase switch and switch box used would have been the No. 132 box with the Delta number SP-2458 Cutler-Hammer two-pole ball tipped switch (Cutler-Hammer Catalog No. 8187). For three-phase operation the Delta No. 1320 Allen Bradley switch would be substituted. Because of the size of this switch it was mounted to a metal plate (LTA-512) that in turn was mounted to the front of the saw. Onto this metal plate the user would affix the switch plate. This switch plate was the only place on the saw where the name Unisaw was printed. 1944: Switch plate (LTA-445) was temporarily made from sheet steel, probably due to wartime shortages of aluminum. 1939: The cast iron goose egg motor cover (LTA-474) was made available as an accessory (Cat. No. 1454). It weighs 23 pounds and held in place by four #12-24 x 1/2" Indented Hex Head Self-Drilling screws. Photo credit goes to User:Torquester: http://vintagemachinery.org/classifieds/images/14616-3-z.jpg. UPDATE 2019: The screws were originally documented here as 1/4-20 x 1/2" (in 2008), but User:antioxidant found #12-24 x 3/4" to be a perfect fit on his machine. 1/2" length was simply too short. The #12-24 thread matches the miter gauge's threads as well. 1939: Handwheels (LTA-420) have un-painted rims and painted spokes. The handles are also un-painted. 1939: Hand wheel tightening knobs (TCS-273) were fitted with a threaded stub that projected 7/8”. When tightened it pushed a small rod within the Tilting Worm Shaft Assembly (LTA-418) or Raising Worm Shaft Assembly (LTA-419) that spread two Wedge Keys (sometimes called butterflies) (LTA-458) to prevent the hand wheel from turning. These knobs were painted black. 1939: The original saws did not have the traditional rectangular serial numbering plate found on later saws. These saws had their serial numbers stamped onto the tilt raising scale. 1939: The first Unisaws were fitted with four cast iron feet (LTA-453). 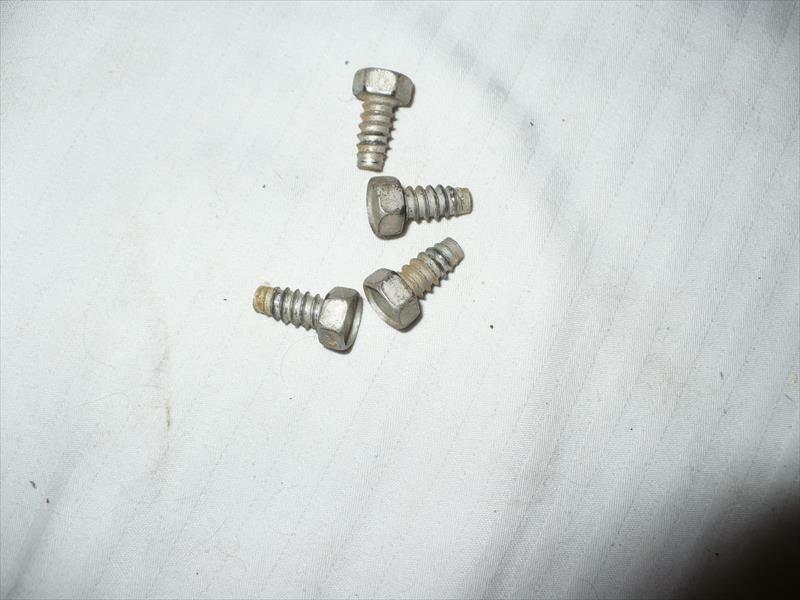 These were held in place with sixteen 5/16-18 X 1” carriage bolts. 1940: The cast iron feet were replaced by the one piece LSR-49 cast iron plinth. 1939: All motors were 8 ½” frame bullet end. Motors weighed anywhere from 95 to 110 pounds depending on type. The following motors were offered. All units have triple belt drives. 1939 Units had pot metal triple belts pulleys. Units with 1750 RPM motors had 5.25" diameter drive pulleys which were also pot metal. 19XX units changed to steel machined arbor pulleys. 3450 Motors had smaller 3.25" diameter pulleys that were machined from solid steel.